The humble USB memory stick is anything but stylish, and it is certainly not environmentally friendly. 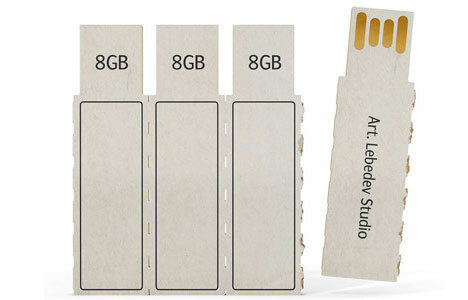 Lovable design group Art Lebedev wants to switch up our view of those easily-lost memory sticks by making them cheaper, smaller, lighter and less environmentally damaging. The concept is called Flashkus, and it mashes high-tech and low-tech together perfectly. Instead of the usual plastic, these memory sticks would be made of simple cardboard and come four to a perforated card. When you need to store or share information, you just tear one off. 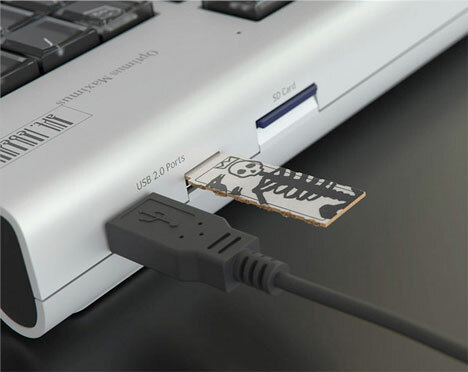 You can write directly on the cardboard with a pen, making it simple to keep track of what is stored on each memory stick. It would be interesting to see whether cardboard would be sturdy enough to protect the data on these storage devices; if so, they could be carried around in wallets or purses until needed. Art Lebedev is famous for coming up with awesome ideas that never make it to production, so we aren’t holding out much hope for this one to be stocked on store shelves anytime soon – but we hope the clever data storage device someday replaces those clunky plastic things we’ve been carrying around for years.